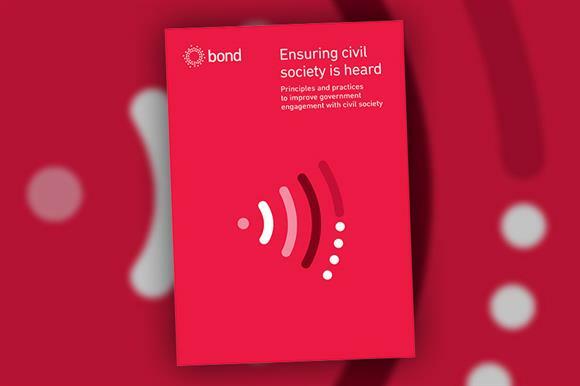 The government is ignoring the views of civil society organisations and increasingly treating them as suppliers rather than partners, according to a report published today by Bond. Ensuring Civil Society is Heard calls for government engagement with the sector to be more meaningful, inclusive and deliberative to improve policy-making and reduce errors. Bond, a UK network for more than 400 international development organisations, claims that commitments made in last year's Civil Society Strategy by the Department for Digital, Media, Culture & Sport and the 2016 Civil Society Partnership Review by the Department for International Development are not being followed through. Brexit, the report says, is making things worse by diverting civil servants from their jobs. To illustrate this, it says a DfID session on financing for development was cancelled a week before it was due to take place because of resource pressures linked to Brexit. "This paper is a response to failures in the UK government to adequately engage and consult with civil society organisations, leaving them excluded from decision-making processes and exposing government policies and programmes to avoidable errors," the report says. "Engagement between government and civil society has not lived up to its potential, often being limited and unproductive. "Despite the UK government’s long-established commitment to working with civil society organisations, many organisations are left frustrated and excluded." Claire Godfrey, co-author of the report and head of policy and campaigns at Bond, said it had set out to investigate to what extent the 2016 DfID report, which pledged to make its work with civil society more "meaningful, strategic and efficient" and "to involve a broader range of organisations", had been acted on. The conclusions are based on analysis of recent engagement since then, feedback from the chairs and members of some of Bond's 44 working groups and individual case studies. Godfrey told Third Sector that the DfID report and the DCMS's Civil Society Strategy "both showed willing and good sentiments that aren't being followed up". She added: "Any political oxygen around global and domestic challenges is being consumed by Brexit, which is making the rapid decline in civil society engagement around government policy even more detrimental. "Now is not the time to be shutting civil society out. Now is the time for meaningful, inclusive and deliberative engagement." The report highlights DfID's decision to include only the civil society organisations it funds the most in a strategic relationship management system set up in January 2018 as an example of the increasingly transactional relationship. "This has been further exacerbated by the increased use of fund managers, where grant management is contracted out to private sector consultancy firms," the report says. "UK Aid Connect is now the only fund which DfID manages centrally." A DfID spokeswoman said: "DfID has a proud track record of working with civil society organisations in every aspect of its work. From driving up safeguarding standards across the aid sector to the UK’s world-leading humanitarian response during crises like Cyclone Idai, working with these vital organisations is at the very heart of our decision-making."